I was invited by Chevrolet to participate in their press event to unveil the Sonic the Friday morning of the comic con. We were to meet a The Highliner Diner in Manhattan, were we were given an overview of the car itself and their marketing plans for it. The car was built from the ground up to be a sporty ride in both a hatchback and sedan with top of its class in its safety features for all the worldwide markets that it was planned to be released in. Since the car is going to be aimed at younger drivers, the marketing is going to be online for the first few months. I thought it was a really novel approach, with the initial rollout starting during comic con weekend. A Chevy Sonic was pushed out of a plane to parachute down to Earth while skydivers captured it with 27 different cameras, although we were shown a single shot, which we all thought was breathtaking to watch. Another initiative was going to be dropping a Sonic off the roof of a building to bungee jump, but the bungee jump would start after users clicked on the website LetsDoThis.com and the car received a certain number of clicks. Once they briefed us on the cars, they took us out to see them. We were shown the sedan and the hatchbacks as they lined the street in front of the diner. We were walked through the different features of the car before pairing up and taking them for a ride around New York City. I rode with my friend Nick McGlynn as we played with the different features in the car, from the hands free calling to the iPod/iPhone integration. Down the West Side Highway and back up the East River Drive to cross back over 42nd Street and down to a parking lot outside the Jacob Javitz Convention Center, where we were escorted inside to see the Sonics on the show floor. They had several Sonics wrapped with art from artists at the convention, from Neal Adams to Tokidoki to Eric Powell, and a car that artists drew on live, in front of all the onlookers. 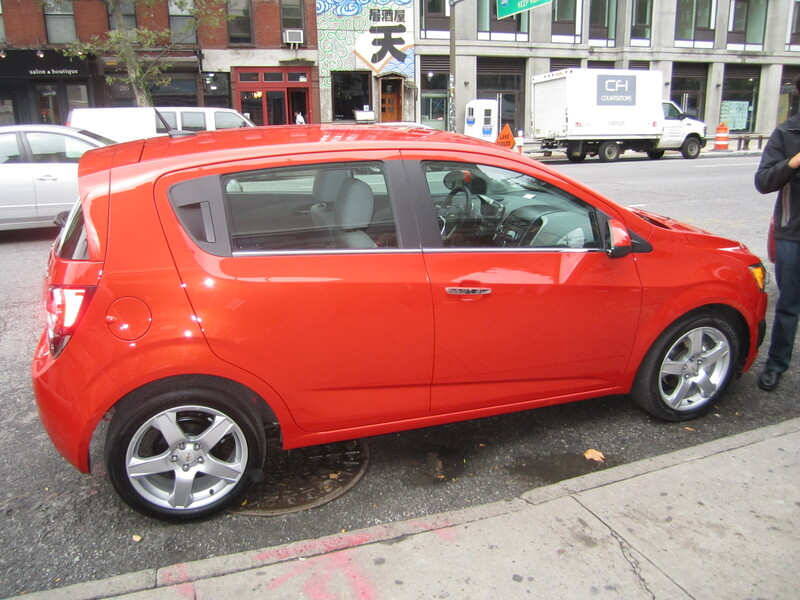 The 2012 Chevy Sonic is a good, sporty car for drivers starting out. Its high measure of safety, mixed with its 1.8 liter 4 cylinder engine, makes for a quality ride for the young drivers that they are targeting with this vehicle.